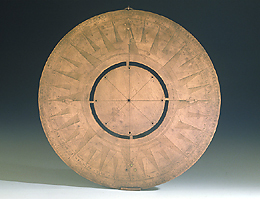 This copper disk probably belonged to a more complex instrument, perhaps a navigational compass. The wind rose allows the directions of the winds to be related to the geographical co-ordinates. On the back of the disk is a wooden foot which allowed the instrument to be placed on a stand. The instrument originated in the Dudley bequest.